Never Let Me Go – the book, the movie! 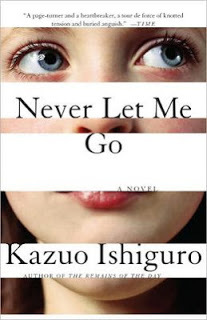 I recently picked up Kazuo Ishiguro’s novel, Never Let Me Go, at my favorite Chicagoland independent bookstore, The Book Table in Oak Park. Ishiguro wrote The Remains of the Day, which I enjoyed, and the blurb on the front quoted Time magazine with “A page-turner and a heartbreaker, a tour de force of knotted tension and buried anguish.” Sold! The story opens in the first person, with 31-year-old Kathy H. talking about her career. She’s some kind of healthcare worker, supporting donors of some kind, and reflecting on her experiences, her life, and her upbringing in Hailsham. As a child, she lived in Hailsham – a boarding school in the English countryside – where the rules were strict, but there was fun to be had and friends to be made. And as Kath recalls and recounts her life, it becomes apparent that something has happened in that world that never happened in this one: a mid-century scientific discovery has led society to clone human beings and raise these children to be donors, stripping them of their organs much as a junker car is kept around for spare parts. Against this matter-of-fact macabre background, there is a love triangle, for Kathy loves Tommy, who is stolen by Kathy’s beautiful best friend, Ruth. And so for these three, what little happiness they could have had is taken from them by humility, entitlement, compassion and fear – all too human traits, considering that society seems them as subhuman. As they transition into the world, Kath becomes a “carer,” who comforts and helps the donors after they recover from each donation. (Donors will typically manage three or perhaps four donations before they “complete.”) And of course the story plays out as Kathy cares for Ruth and then for Tommy, enjoying at last a brief period of love and even hope – which is, of course, doomed. Let us just say that there were sniffles. Plenty of them. Several hankies worth. Then I discovered that the book had been made into a movie in 2010, starring Carey Mulligan as Kath, Keira Knightley as Ruth and Andrew Garfield as Tommy. The film is well-cast (although Tommy is not quite as strapping in the movie as he was in the book – I would have like a more robust actor) and faithful to the story, for the most part. It was awesome. More sniffles on my part. On the other hand, my husband (who hadn’t read the book) said it dragged. He fidgeted. Open mocking of wifely sniffling. My conclusion: Husband, mean. Book, good. Movie, good. Both, double good. Go for it. This entry was posted in Commentary, Review and tagged Andrew Garfield, Carey Mulligan, Kazuo Ishiguro, Keira Knightley, movie, Never let me go, Review. Bookmark the permalink.